- Senator Joseph R. Biden Jr. 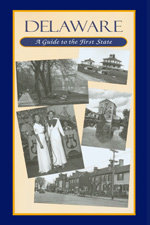 This book is a compilation of oral history interviews with many of the recent and long-settled immigrants to Sussex County, Delaware. It details the life these individuals are creating for themselves and how they are becoming Delawareans. To many, the First State represents hope and a bright future. One Hundred Year History of the Pilots' Association Bay and River Delaware, by Andrew Knopp, 1996, 133 pp. Prices reflect the cost of the book PLUS S&H fee of $3.00. Man and Nature in Delaware: An Environmental History of Delaware, by William H. Williams, 2008, 301 pp., HARDCOVER. Prices reflect the cost of the book PLUS S&H fee of $5.00. 01. A History of Delaware Through Its Governors, by Roger A. Martin, 2015, 555 pp., HARDCOVER - Prices reflect the cost of the book PLUS S&H fee of $7.50. 02. Delaware's Destiny Determined By Lewes, by Randy J. Holland, 2013, 152 pp., HARDCOVER Prices reflect the cost of the book PLUS S&H fee of $5.00. 03. Captain Thomas Macdonough, Delaware Born Hero of the Battle of Lake Champlain, by Virginia Mason Burdick, 1991, 100 pp. Prices reflect the cost of the book PLUS S&H fee of $3.00. 04. Man and Nature in Delaware: An Environmental History of Delaware, by William H. Williams, 2008, 301 pp., HARDCOVER. Prices reflect the cost of the book PLUS S&H fee of $5.00. 05. The Journals of the Rev. Lewis Wheeler Wells, and the Photograph Album of Leila Parker Burton Harthack of Millsboro, Del., 2009, 32 pp. Prices reflect the price of the book plus S&H fees of $3. 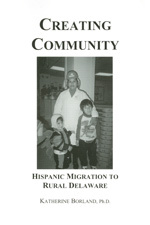 Notify me of updates to Creating Community: Hispanic Migration to Rural Delaware, by Katherine Borland, Ph.D., 2001, 393 pp., includes Spanish audio CD. Prices reflect the cost of the book PLUS S&H fee of $5.00.